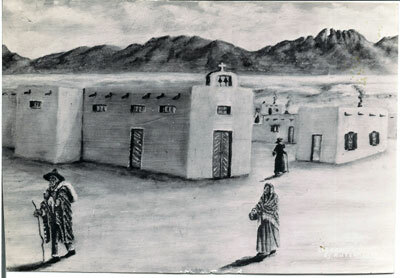 Painting done by Mr. Albert J. Fountain Sr., from memory of St. Genevieve Church in Las Cruces, NM in 1859. Fr. Manuel Chavez was installed as the first pastor of this newly formed parish. St. Genevieve Church built under the leadership of Fr. Pierre Lassiagne and Mother Praxedes Carty, Sister Superio of the Loretto Convent. 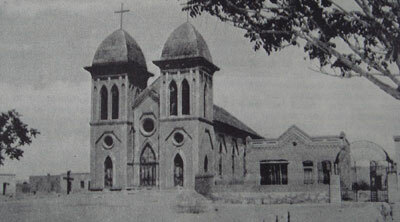 The church was built directly over and around the old church and not a service was omitted during the progress of the work. 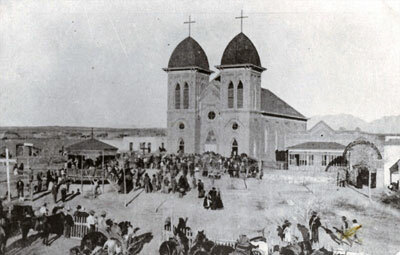 The new church was solemnly dedicated on Oct. 15, 1887. St. Genevieve Church was the center of Las Cruces where majority of activities took place, from religious, political, theatrical, social etc. 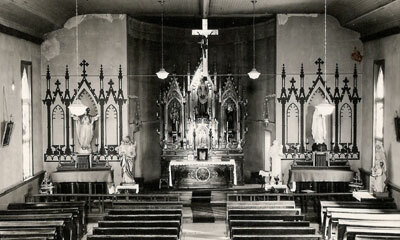 Interior of St. Genevieve church circa 1930s or later. Damage can be seen on the walls. Many of the statues shown are still in use in the present day church. The two side altars which apprear to have the niches and crocketts like the high altar, are actually painted on the wall above the altars. 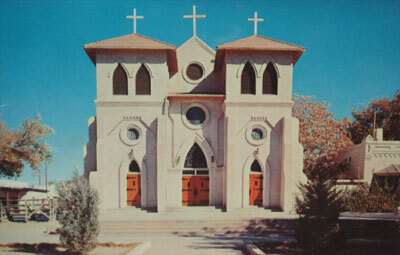 St. Genevieve Church as it looked in 1967 prior to its demolition. The foundation could not support the tall french towers so they were shortened. Side view of St. Genevieve Church. 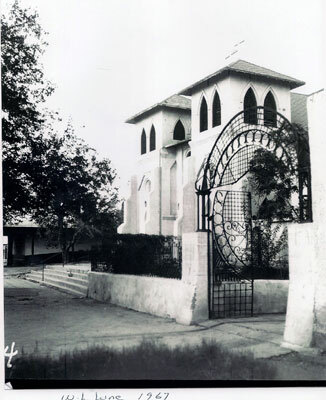 The wrought iron gate at the entrance to the rectory was designed by Fr. Pierre Lassaigne and built by Mr. Carl Clausen (whose wife Maria Anita was the sister of Albert J. Fountain) The gate has the initials "P.L. "for Fr. Pierre Lassaigne.